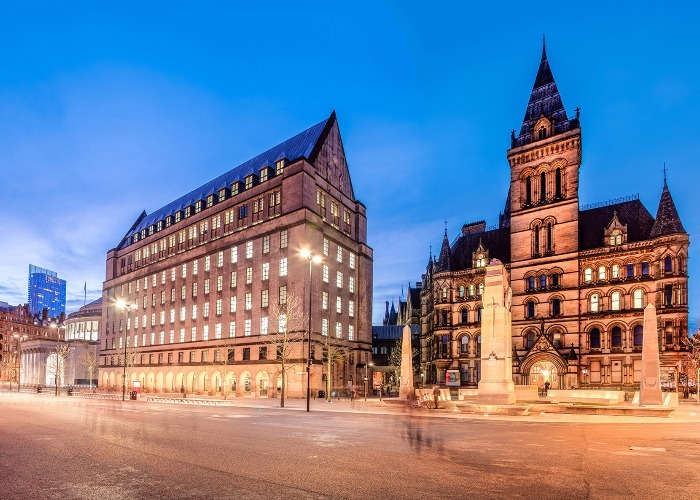 The city of Manchester prides itself on many things: world-famous football teams, legendary music scene, celebrated tram system and of course, the much-loved TV soap, Coronation Street. Manny, Madchester, The Rainy City – whatever you like to call it – it’s an excellent place to spend a weekend. Here are our favourite things to do in Manchester. Much of Manchester’s illustrious history revolves around the Industrial Revolution thanks to the textiles industry which was booming here, in the 19th century. In fact, Manchester became the world’s fastest growing city. And in between the shiny new architecture you see today, you’ll spot former cotton mills and warehouses which earned Manchester its ‘Cottonopolis’ or ‘Warehouse City’ nicknames. Some of the best examples are found around Ancoats, Whitworth Street, Princess Street and the Northern Quarter. As architectural styles became more sophisticated, many adopted elaborate Italian palazzo designs. Today, the city’s hard-working past has not been forgotten. The worker bee image, which appears on the Manchester coat of arms, can be found across the city. Mancunians also flocked to get tattoos of the historic emblem as a symbol of strength following the 2017 terror attacks. Enjoy a weekend in the city and perhaps you’ll get a sense of this bold and resilient character yourself. Here are the top things to do on a weekend in Manchester. Check-in to: The Cow Hollow Hotel which occupies a former textiles warehouse in the trendy Northern Quarter – an easy 10-minute walk from Piccadilly train station. Wrought-iron interiors, beds made from railway sleepers and original factory doors give it a cool Manhattan-meets-San Francisco vibe. Catch a show at: HOME. Showcasing a variety of contemporary and indie films, theatre and dance shows, this arts centre features both emerging and well-known international artists. It’s well worth checking out for talks, exhibitions and film festivals too. Award-winning director Danny Boyle and actress Suranne Jones are both patrons here. Eat at: Home Sweet Home. It serves up excellent comfort food (nachos, fried chicken, waffles, burgers and loaded fries) in a colourful, homely setting, with a great cocktail and wine menu, plus nostalgic favourites like dandelion and burdock and cream soda. Have a nightcap at: Dusk til Pawn. This speakeasy-style bar disguised as a pawn shop is a former fortune teller’s den and is now one of the trendiest spots to enjoy a bourbon-based cocktail while the jukebox provides the soundtrack. Have coffee at: Ancoats Coffee Co and shop for an array of Peruvian, Kenyan, Brazilian and Ethiopian coffee beans. Ask baristas about their Warehouse City Espresso that nods to Manchester’s industrial past. The historical Royal Mills in which its housed, also holds occasional craft and vintage markets over the weekend. Explore: Ancoats. Once dubbed the ‘workshop of the world', there’s now a buzz around this once-dilapidated area as a burgeoning restaurant scene starts to unfold. Stroll along the canal, explore the former mills and factories and stop by the Cutting Room Square ‘Sentinels’ – five giant monoliths displaying images of textile mills that once stood here. Have afternoon tea at: Teacup Kitchen. This quaint Northern Quarter café serves a lovely afternoon tea and wholesome lunches, with many vegetarian and healthy options and great selection of specialty teas. Visit: People’s History Museum, which celebrates the history of working people and holds the largest collection of political material in Britain. Highlights include a collection of trade union and political banners and exhibitions about the suffragette movement, led by Manchester’s political activist Emmeline Pankhurst. Dine out at: Manchester House. This upscale restaurant in trendy Spinningfields has been tipped for a Michelin star many times and you’ll see why when you try its inventive food. Splash out on the tasting menus (£75 for eight courses, £95 for 12) or enjoy a more purse-friendly afternoon tea or à la carte lunch. Make room for the indulgent cheese trolley. Go for drinks at: Albert's Schloss. This beer hall is as Bavarian as it gets and is bouncing most evenings, thanks to regular jazz, cabaret and DJ nights. Order an apple strudel cocktail, heritage Schna­­­pps, or try their own-brewed Saxe Coburg session ale. Visit during the day for their tasty cruffins and kronuts. Have brunch at: ­­Federal Cafe. This Antipodean café and bar heaves with brunch fans at the weekend, but the all-day menu is worth queuing for. Highlights include açai bowls, French toast and Turkish eggs on sourdough. Visit: The National Football Museum. Spread across six levels of the Urbis building, this famed sports museum features memorabilia and interactive exhibitions about the lives of the greatest footballing icons. Have Sunday Roast at: TNQ, The Northern Quarter Restaurant & Bar. This stylish-but-chilled restaurant offers three meat options (vegetarian also available) with crispy Yorkshire puddings, truffled cauliflower cheese and all the trimmings. Leave room for sticky toffee pudding – a great way to sign off the weekend before hopping on the train home. For a pint: Dukes 92. This trendy watering hole on the historical Castlefield locks is a long-time favourite in Manchester. There’s an interesting selection of draught lagers and Pale Ales and it’s always lively at weekends. The terrace is the place to be when the sun’s out. For a dose of art: Visit the Whitworth Gallery. This newly revamped gallery hosts everything from historic fine art to wallpaper and textile collections and contemporary sculptures. For a dose of history: Castlefield offers a glimpse of Manchester’s greatest feats of engineering. It’s home to the 1761 Bridgewater Canal and a series of viaducts which formed a key route for the historic Liverpool and Manchester Railway. Also in Castlefield is the Roman era fort of Mamucium and the famed Museum of Science and Industry which occupies the oldest surviving railway station in the world. For great live music: Drop by Matt and Phreds. One of Manchester’s oldest live music venues, it provides live music entertainment six nights a week and has hosted world-famous jazz artists. For stunning architecture: Drop by the city’s best squares. The city’s town hall in Albert Square boasts striking Neo-Gothic design and the Albert Memorial is strikingly similar to the namesake monument in London. Nearby, the Free Trade Hall off St Peter’s Square (location of the notorious Peterloo Massacre) is resplendent in Italian palazzo design while the Grade II listed Royal Exchange building off St Anns Square is one of the most treasured buildings in the city. For a top-notch curry: Take a taxi to the famed Curry Mile. This clutch of 70-plus restaurants in Rusholme and is said to have the largest concentration of Asian restaurants in the UK.